This blog is dedicated to the empowerment of girls and young women. Yes, friends, the mind games have begun! Two days ago, the English and Wales Cricket Board (ECB) announced that it has made an offer to West Indies Cricket coach, John Dyson, for him to coach the English cricket team. As soon as the announcement was made, one member of the West Indies Cricket Board (WICB), Donald Peters, confirmed that an offer had been made. However, today, the WICB denied that any such offer has been made. I guess the ECB feels that if they can't beat the West Indies Cricket team (Windies) on the field, that they might as well play mind games to try to beat them mentally on and off the field. It is my hope that the Windies team will let their batting, bowling and fielding be their response to the ECB, re employing Dyson, whose contract with the WICB is up late 2010. As Bob Marley said, in his famous song,"Bad Card": "Them a-go tired fi see wi face", Jamaican (paraphrased), meaning, (the English team) will be tired to see the Windies faces...up in theirs, wining and wining and winning! Let the games and friendly banter begin! 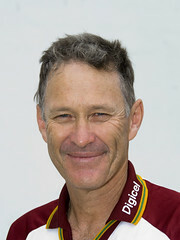 I would like to thank caribbeancricket,for the use of his Flickr inset picture, above, of John Dyson. Please click "Bad Card" to see Bob Marley and the Wailers' lyrics and performance of "Bad Card", at Tuff Gong Studio, in 1980. 2) Article,"WICB confirms England approaches Dyson", CNews Interactive, March 18, 2009. View This Site in Your Language, Here! Financial Accountability to God: Is God Being Unfair? The Hand That Rocks the Cradle Rules the World! Pet Care With a Twist! Congrats, St. Jago, For Winning Schools Challenge Quiz 2019! Scholarships Available Via Our Twitter Account, @GWAPBlog ! The Race to a Healthy 2050: Cut Sugar and Red Meat Consumption by Half! Read This, Before You Drink Your Next Can of Soda! Habemus Papas - The Catholic Church Has a New Pope! Jamaican Sites That Link Here! We enable technology businesses and professionals to capitalize on local and global market opportunities! Jamaicans.com features everything Jamaican including recipes, a travel guide, flashbacks in history & culture, commentary, interviews and Jamaican news. All the links in our directory are direct, so they will improve your link popularity.